Welcome to the NWTC's web site for data from the NWTC tall towers. 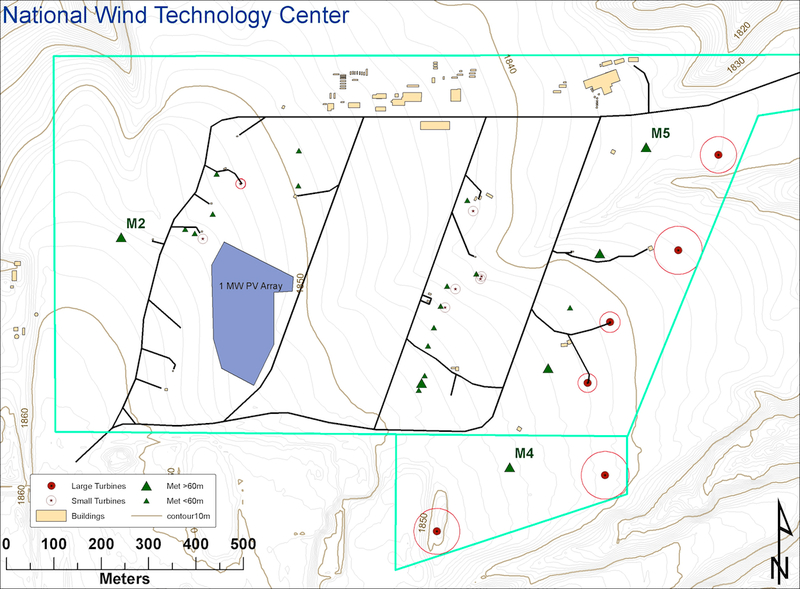 The towers at the NWTC (see map below) are research towers that are used to measure the atmospheric conditions and winds that flow into the site. These data are used for research into how the atmosphere and wind turbines interact. M2 is an 80-m tower at the west end of the site. Commissioned in 1996, the data are used for the NWTC weather display. M4 is a 135-m tower at the south east end of the site. This tower measured the inflow into the southern turbines from 2012 to October 2015 and may return to service in future. M5 is another 135-m tower at the north east end of the site, measuring inflow into a wind turbine. Commissioned in 2013, current conditions are shown here. Data archives can be found here. Use this forum to keep up-to-date with what's going on with the towers and data. Publications about the met towers are listed here. Please note that because the the towers are research towers, we may change the instrumentation and data analysis at any time and without warning. Also, the data may not always be available or up to date, although we make every effort to maintain good data availability. Do not rely on these data for any purpose. The data that are stored in the archives may be preliminary or out of date, and may be changed or removed without warning. All data are made available without any guarantees. Documentation is also preliminary and may be changed at any time. These data and documentation are available in beta-test versions for those who wish to evaluate them. Before using our data, please read the disclaimer.